There are instances when one or two of your Wemo devices will appear with a No Response message in the Apple Home app. If this happens, follow the steps below to remove the error. Make sure you are using the latest version of the Wemo App. Download the latest version of the Wemo App from Google Play™ or the App Store®. Make sure to connect your device on the same local network as the Wemo Bridge. Step 1: Launch the Wemo App. Step 2: If your Wemo device appears grayed out with a Not Detected message, tap to select it and select Hide. These steps will remove the No Response tile from the Apple Home app. Launch the Apple Home app to confirm. If your Wemo device does not appear on the list, you will need to remove it using a desktop browser. Follow the steps below. Make sure to use a computer that is connected to the same network as your Wemo Bridge. Step 1: Determine the IP address of your Wemo Bridge by accessing the DHCP client table of your router or gateway. NOTE: If you are using a Linksys Smart Wi-Fi Router or Velop system, look for the Wemo Bridge in the Devices section of the Linksys app. If you are using a Belkin router, click here for instructions. Step 2: Launch a browser, enter the IP address of your Wemo Bridge in the Address bar. Press [ENTER] once done. Step 3: Enter admin for the username and use your HomeKit™ code as the password excluding the hyphens. 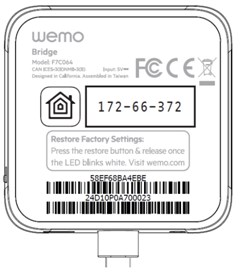 NOTE: The code is located at the back label of your Wemo Bridge. Step 4: In the Wemo Status section, click on the drop down arrow next to Devices. Step 5: Locate the Offline Wemo device/s and click on Remove. NOTE: Confirm the Serial Number of your Wemo device/s to make sure you are removing the correct model from the list. The Wemo tile containing the No Response error should no longer appear in your Apple Home app.